Professional, background checked maids for all your house cleaning needs. Professional, bonded cleaners for all your housekeeping needs. Light commercial and office cleaning services available. New home construction and home remodeling clean-up. We stand by the quality of our service—that’s why we guarantee it. For professional home cleaning, look no further than to America’s trusted name in home appliances and home services, the Maid Services division of Sears. Our professional associates are trained, background-checked, bonded, and insured. 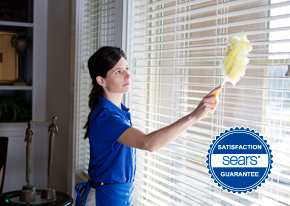 At Sears Maid Services, we take pride in not only performing our home cleaning duties to the highest standard, but also in building a relationship of trust and security with each client we service. For descriptions of our offered services, see below. For more information on our services, scheduling, or employee training, feel free to call. For a one-time or regular cleaning, you can count on the dedication, skill, and diligence of a trained Sears Maid representative. 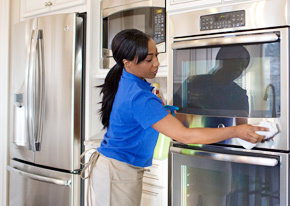 Our associates will tackle those hard-to-clean areas like kitchens, bathrooms, and living areas. For homeowners and apartment renters who need their home or apartment cleaned on a regular basis, you can count on Sears Maid Services. Our associates can work on weekly, monthly, or bi-monthly schedules that fit your schedule. An office space represents the face a company presents to clients, visitors, and office staff. 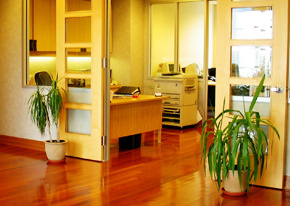 Without a clean office, the entire company itself can feel uninviting. For dependable, thorough office cleaning, trust Sears Maid Services to do the job right. New home construction or home renovation usually leaves behind a fair amount of mess. From silicon and paint supplies to ample dust and dirt, new construction sites need to be cleaned to make them presentable. When you need post construction cleaning, for either a construction company or a homeowner, call your local Sears Maid Services office and get your site cleaned in no time. 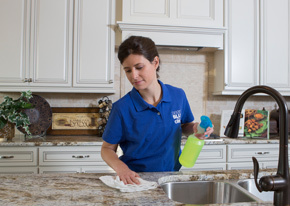 We understand that allowing a maid service access to your home can be the cause of some anxiety. We agree, and we know the intimacy involved with having someone else in your home. That’s why our employees are background-checked and our service locations licensed, bonded, and insured. As a company, we hold our associates to the highest standard of integrity and ethics. Receive a free estimate and schedule your cleaning service online today. A Sears representative will contact you promptly, usually within the next business day. We were pleased with everything, from start to finish. It is such a relief to us to find someone trustworthy to help. It made us feel reassured that it was Sears. I love a clean kitchen, but with health problems and so forth, it has made me really miserable and down in the dumps that my beautiful kitchen was just downright dirty. Michele and Becky never made me embarrassed. They were so very nice, and they worked so hard! Great job! We've had other cleaning people, but never felt so satisfied and happy. We will definitely want them back again. Very pleased with the results. I appreciate that the the team leader asks me to survey the work done before they leave to make sure I am satisfied. And they are very responsive if I find something that needs further attention. I was especially impressed with the excellent job done on the kitchen floor! 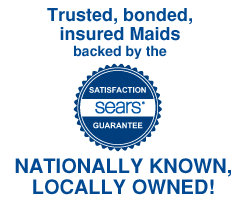 All Sears Maid Services Franchise Locations are Independently Owned and Operated.